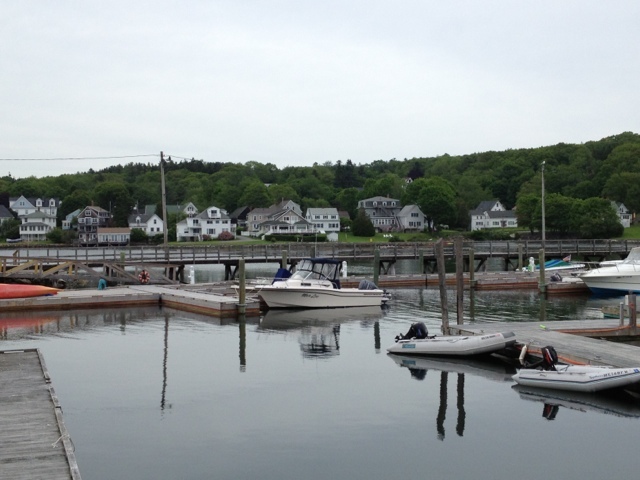 A few days before that Sara's wedding, three of us (bride included) slipped away to Boothbay Harbor's downtown area for a quiet lunch on the water. We walked right into McSeagull's restaurant and took a seat on the outdoor deck. 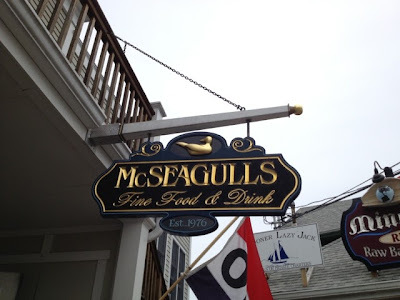 McSeagull's menu is so crazy, unbelievably, astoundingly long, that our server had to come back to us three times before we made up our minds. The categories are little confusing, and some seem mildly similar to the others, so I felt a little lost. I'd condense that one a bit! I still hadn't had my chowder that week, so I ordered a cup of it. It was creamy, had a nice tang from the white wine, which I loved and it was soothingly delicious. 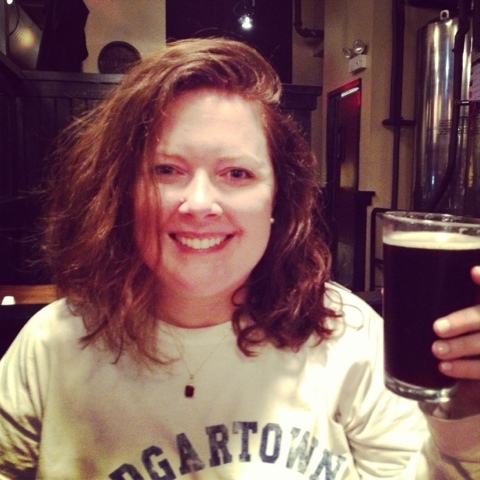 I also had a glass of the Allagash White, a beer brewed in Portland. 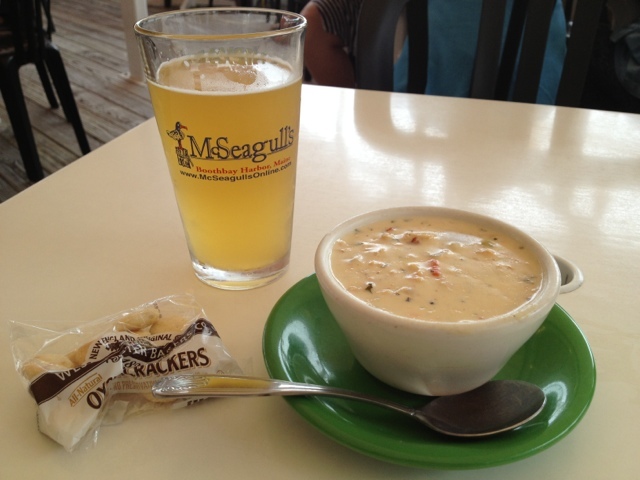 Beer and chowder, so far off to an excellent start! I ordered broiled scallops which came with french fries. 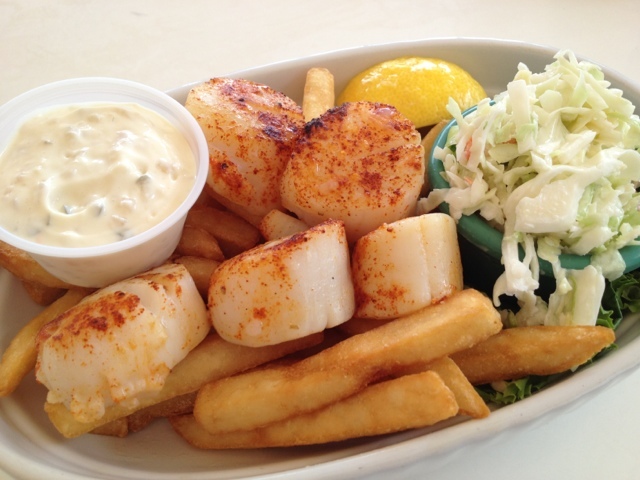 Okay, not all that healthy, but better than the all-fried seafood dish I considered for a hot second! 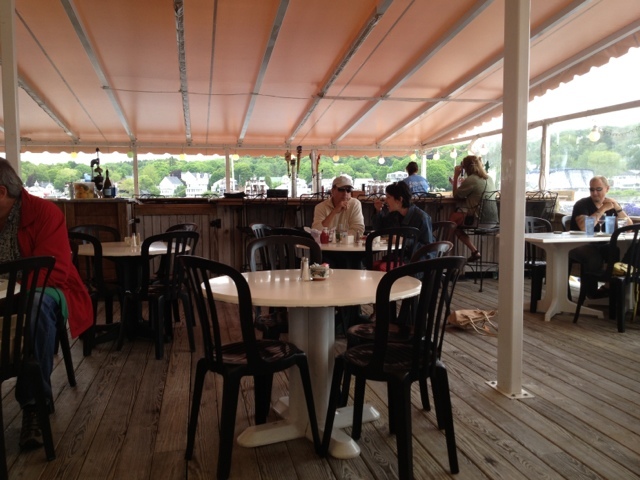 The outdoor seating is nice, the view is lovely, and it's a good starting point for the area. It wasn't melt-your-face-off delicious, but it was decent, and the outdoor seating kicks it up a notch or two for me. Post on my favorite meal on Boothbay coming soon! My favorite restaurant as I was growing up in Attleboro was Bliss Brothers' Dairy: their burgers and sundaes are nostalgia in food form! 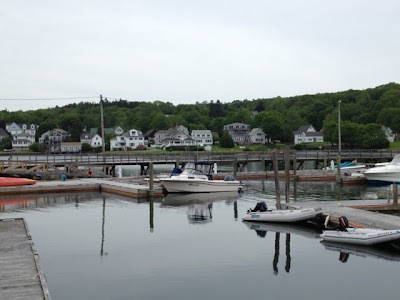 Shortly after ABF's & my last visit, they went under a major remodel, which we got to see for ourselves last month while making our way up towards Maine. I was relieved to see that it basically looks the same, just fresher and more modern. There's new flooring, the booths all got tuneups, and a former coat-rack area now has even more seating. Even though we arrived a bit before the lunch rush, the place was packed (though I took these pics on our way out when it was, well, less packed)! Of course, the change comes with new menus, including a separate 'build your own burger' list for each person at the table. Fun, but perhaps for another visit! You see, it is extremely rare that I have a 'usual' anywhere-- but that is absolutely the case at Bliss. I started with a raspberry lime rickey. NO ONE makes a more delicious one than Bliss. ABF had a Coke, and they both came in these classic soda shop-style glasses. The companion to my 'usual' beverage? 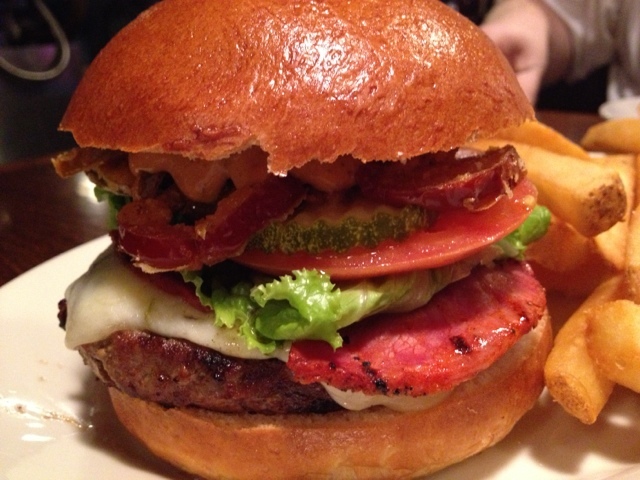 The Bliss Special: a burger with Vermont Cheddar, bacon, lettuce & tomato. I wouldn't change a single thing about this burger. It is sublime. 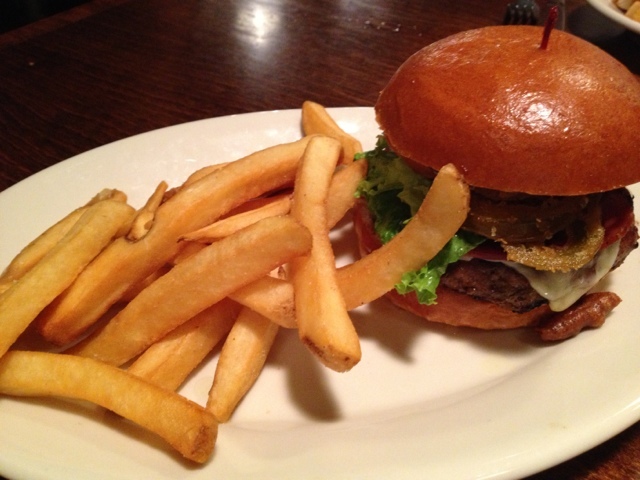 My burger was definitely cooked past medium (my preferred way to eat a burger), but it was still juicy and satisfying. I love, love, love the crinkle fries, too. ABF ordered their Cuban sandwich, which is definitely a new item for their menu! This MUST have weighed a few pounds-- it is a huge, hefty serving, something you could easily split. ABF didn't even finish it, and he's one tall dude! I had two, maybe three bites of ABF's sandwich... it was crispy, salty, delicious, and above and beyond what I expected. Well played, Bliss! ABF said he was too full for his own dessert, so instead of getting my usual small-sized butterfudge (BUTTERSCOTCH + FUDGE IS AMAZING) sundae, I upsized it to share. ABF had more than a few bites of this, and he happily admitted I'd made the right call. Butterfudge is ALWAYS the right call! On our way back to the car, I had to stop for a drink at the 'bubblah,' or bubbler, an old Massachusetts-area nickname for water fountains (a term I dropped very quickly once some Oklahoma middle schoolers mercilessly ridiculed me for using it -- ah, first day at Sequoyah, you were a HOOT!). We used to stop at the bubbler on our way out-- I don't know about you, but ice cream always makes me crazy thirsty. Anyway, that bubbler has been around for as long as I can remember-- and it's still.. bubbling! Some things, at least for now, DO stay the same! I was very happy to see that while Bliss has had a nice face lift, it still is just as delicious, welcoming, and affordable as always. I hope it's around for another century or so-- long live butterfudge! On our way up to Sara's (of NYCNomNom) wedding last month, ABF & I made a few stops along the way. The first one: rain-soaked (and I mean SOAKED) Providence. 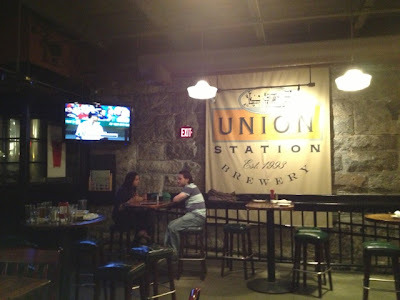 We found a great deal on Hotwire for the Omni hotel, which was steps from Union Station Brewery. That location was crucial, because it was pouring so hard that night we almost had to swim there. Union Station is a pretty large place, just a few steps below the sidewalk. They brew their own beers and have an impressive list. 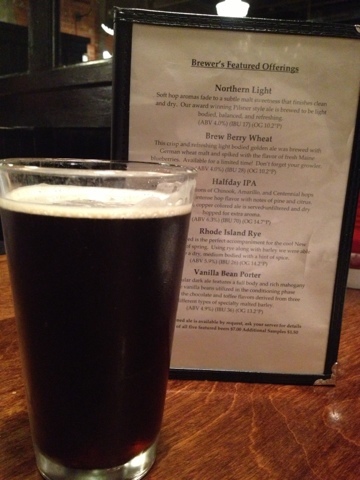 ABF, however, ordered the Vanilla Bean Porter. I had one sip and just about flipped. This was creamy, vanilla-y, and almost chocolatey, too. This is the most delicious beer I've ever had, and I instantly decided I'd get one too (after I finished my martini-- waste not, want not)! 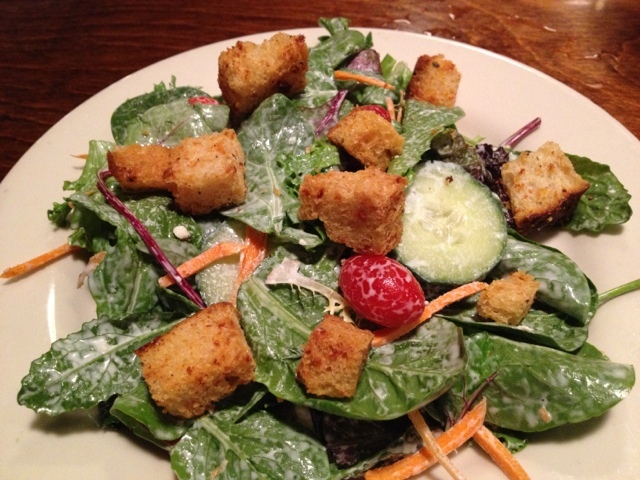 I started with the house salad (mixed greens, carrots, cucumber and grape tomatoes) and blue cheese dressing-- I wanted something reasonably healthy before I went all-out on vacation. This was fine, fresh and crunchy, good dressing, but it wasn't mind-blowing-- I would probably try something else next time. 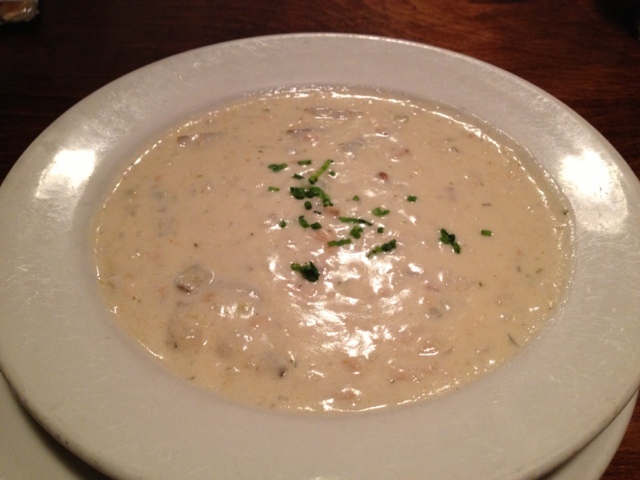 ABF started with the chowdah, which came in a generous serving. This was delicious-- I had 2, maybe 3, bites of this. My main dish was the Union's Trio burger ($12.99), topped with fried cherry peppers, capicola, chipotle aioli, and pepper jack cheese. 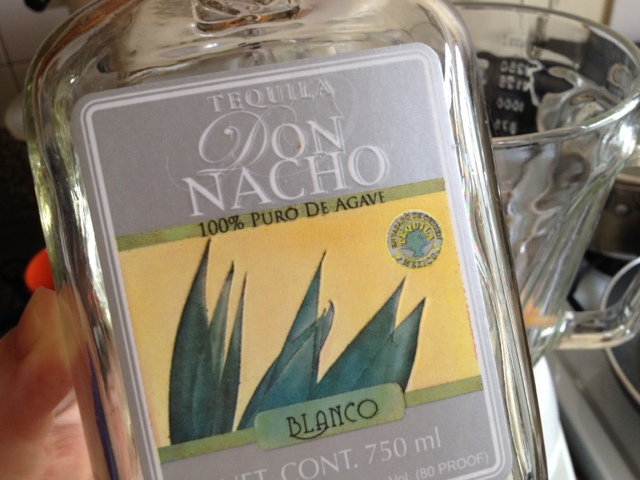 This was juicy and tasty, more "well-done" than my requested medium, but good flavors. 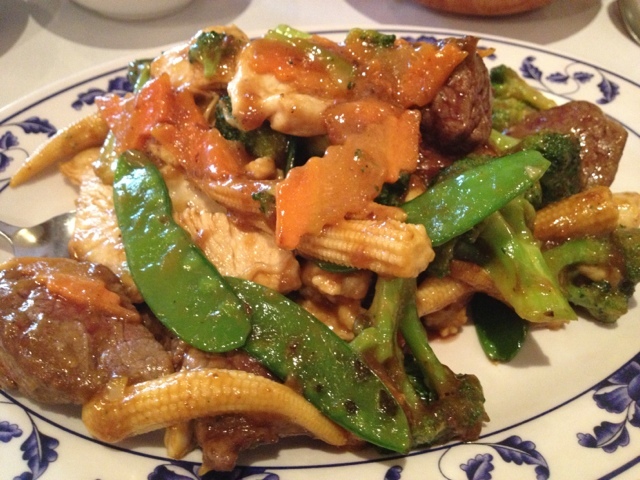 It could have been spicier, and would have preferred the cherry peppers not be fried, but it was quite yummy. 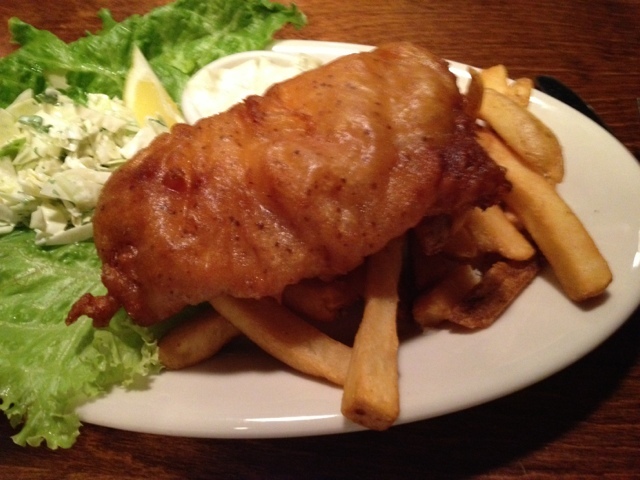 ABF had a house specialty, the Fish & Chips ($13.99), which was ale-battered white fish, cole slaw, fries, and zingy tartar sauce. He's a fish & chips fiend, and he really liked this. The fish had a nice, crunchy coating, and juicy insides. Instead of a dessert, I opted instead for my own glass of that Vanilla Bean Porter. It was like a liquid dessert without even really being that sweet. Our meal was tasty, the location was perfect, and I'd swim through another monsoon and back for another taste of that Vanilla bean Porter! 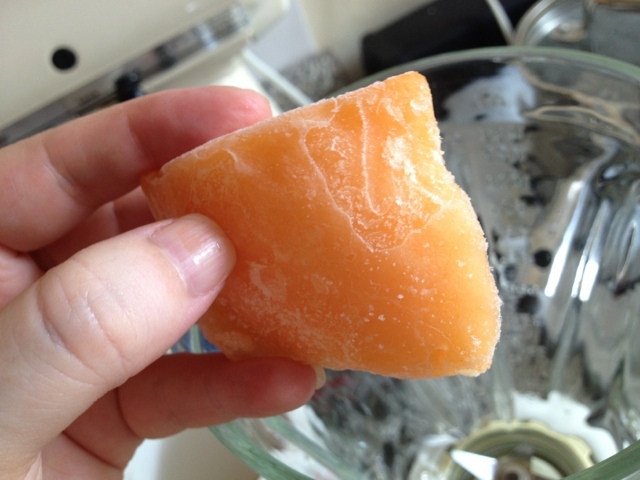 I had a gorgeous, juicy cantaloupe that was going to be less than edible very soon. I knew I couldn't eat it all before it went bad, so I put the rest of it in a Ziploc and threw it in freezer to save for hot steamy day like today. I had just enough tequila left for one margarita. 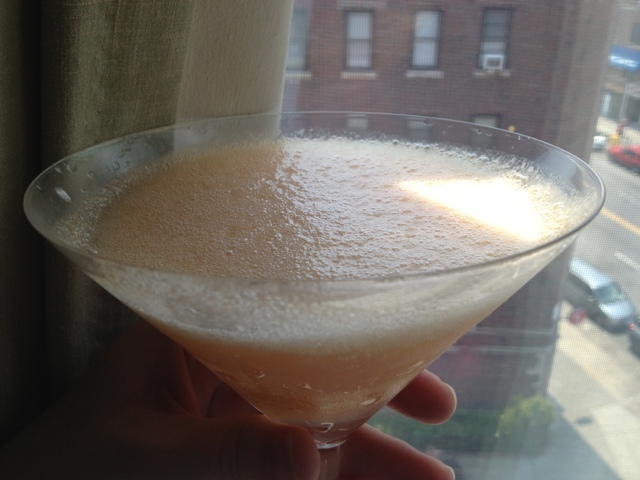 I took a handful of frozen melon chunks right out of the freezer, dropped them into the blender along with the remaining tequila and a few glugs of sour mix. 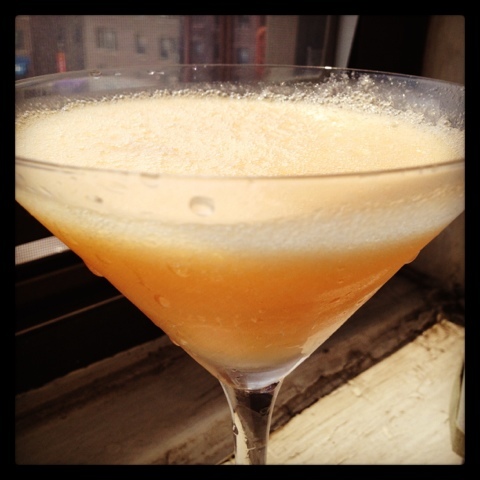 A few whirls in the blender, just enough to puree the fruit, and my drink was ready to pour. It was frothy, icy cold from the fruit but not watered down because of any ice. It was the perfect cooling, refreshing drink for a hot summer day like today. 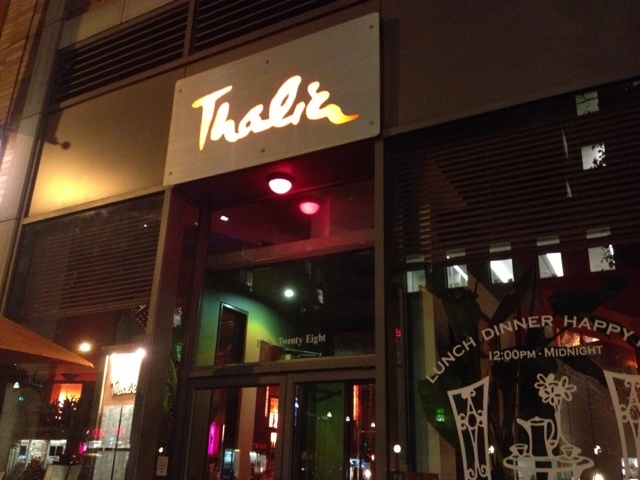 I went with a group of friends to Thalia, a Hell's Kitchen restaurant where they specialize in seafood. 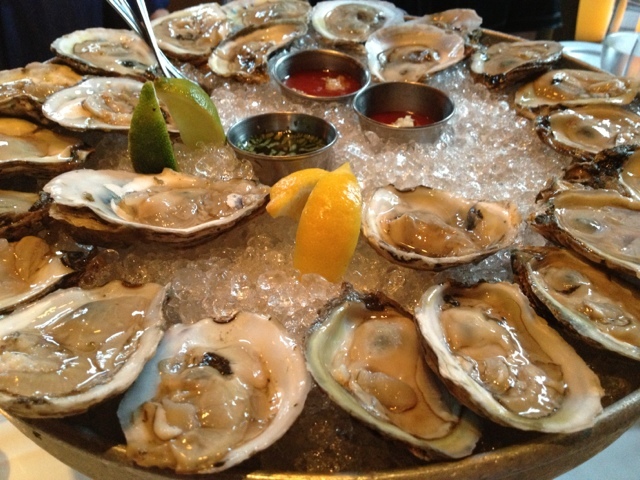 I heard we'd be indulging in oysters, which had me a bit apprehensive. 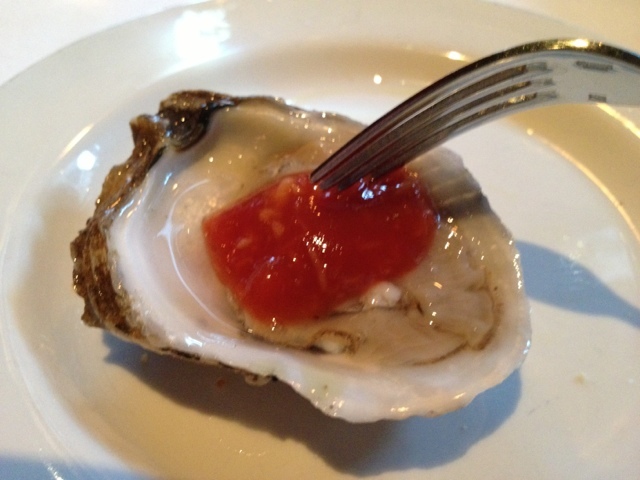 Texture-wise, oysters do not normally appeal to me. Fried? Sure! Raw and jiggling in their shell? Shudder! I would never discourage others from indulging, but I just never really "got" the appeal. However, I do like to push myself to try and do new things now and then. 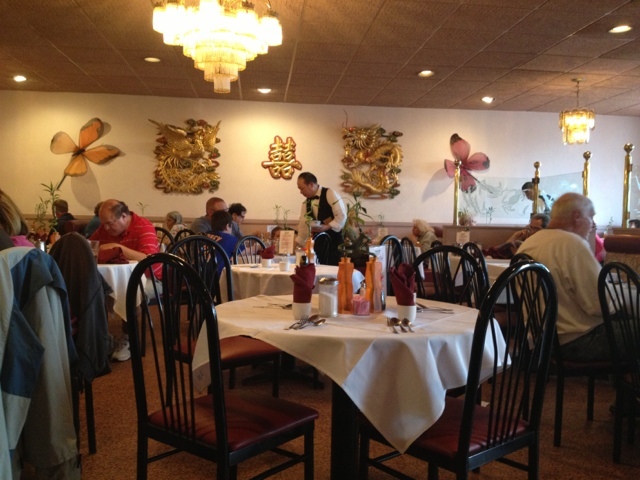 I did mention my hesitation to my fellow diners, and they couldn't have been more encouraging and supportive! 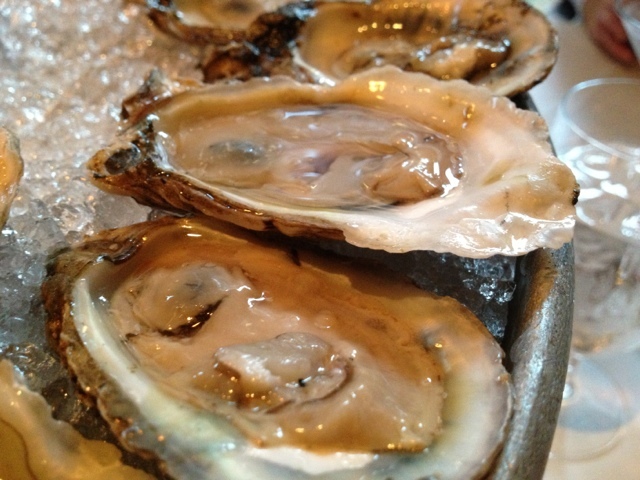 Thalia offers $1 oysters (Chef's choice) from 7p-close, so we got 2 dozen Blue Points from New Jersey. They came with 2 portions of cocktail sauce (deliciously heavy on the horseradish) and a malt vinegar/shallots sauce. 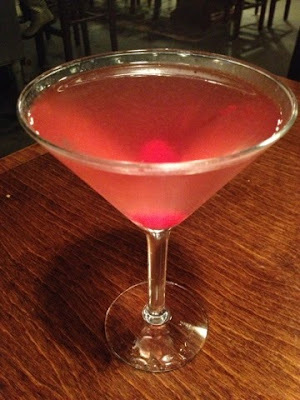 I tried my first one, a small sample with a dollop of the cocktail sauce. 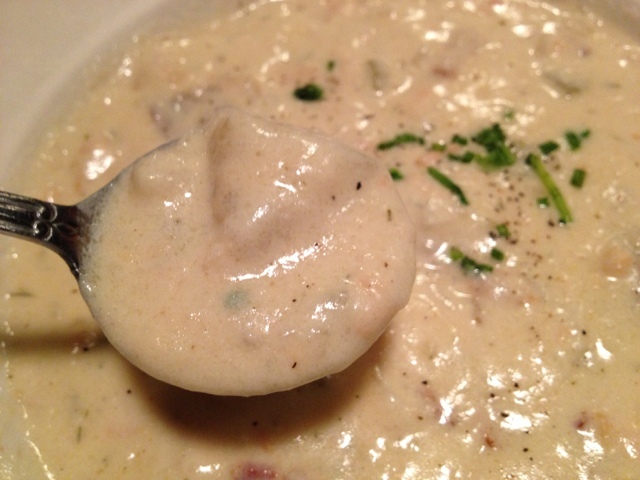 Meaty, not slimy at ALL, and refreshingly tasty! THIS is something I could enjoy eating. In fact, I had 4 more! 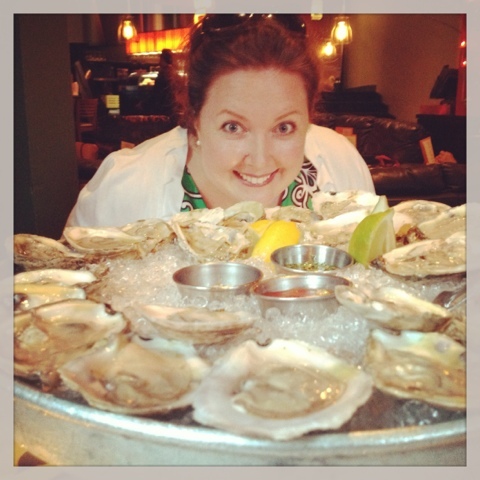 I hadn't eaten that many raw oysters in all my LIFE before then. Gold star for me! 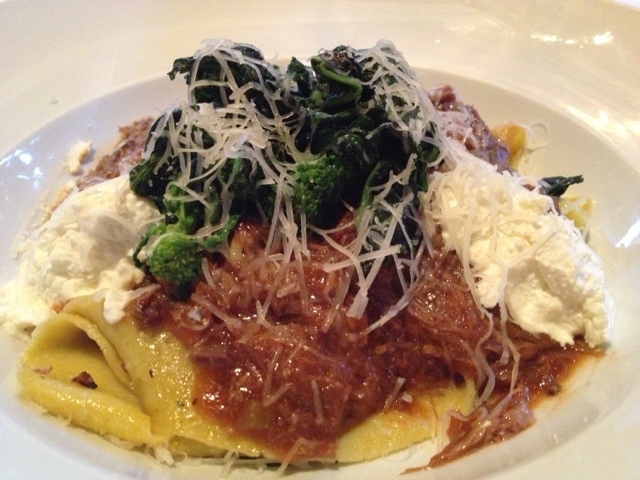 We moved on to main courses- my entrée was the pappardelle with lamb ragu, ricotta cheese, broccoli rabe and mint - dusted with a nice layer of shredded Manchego cheese. Broccoli rabe is almost always a deal-breaker for me, as I'm not a fan of bitterness, but this was perfectly cooked, mild, soft and tasty! My friend and former news colleague (I've left the biz-she's still in it and just won an Emmy!) 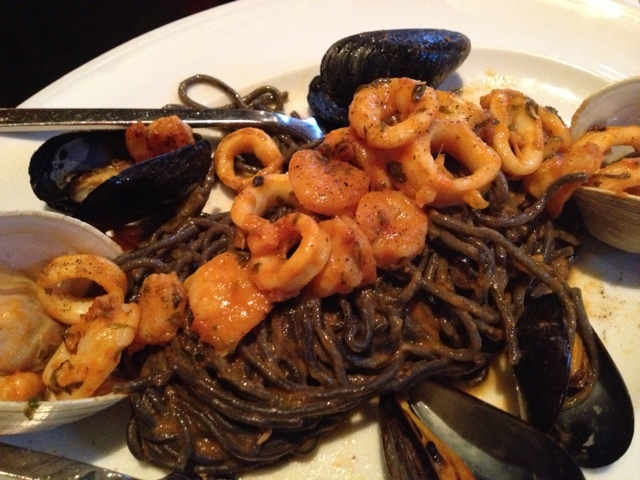 ordered the squid ink capellini, which she loved. 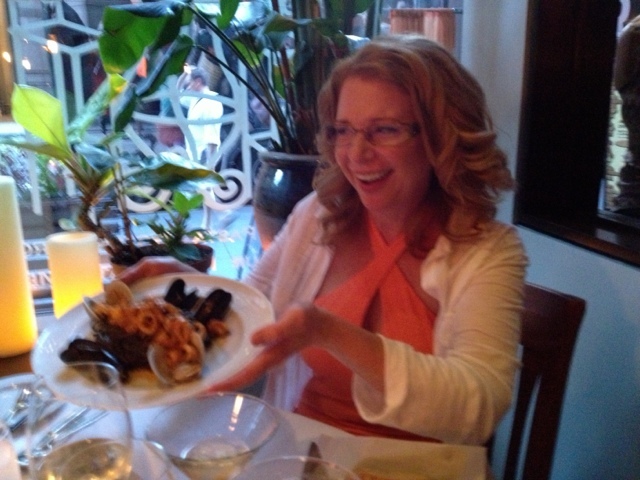 I sampled it- delightfully delicious with the perfect touch of the sea. 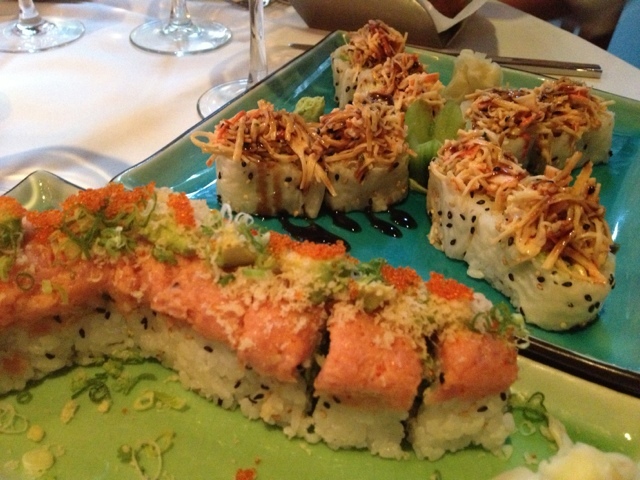 Thalia also has sushi, which looked delicious - I was already too full to try this, but everyone else raved about it. 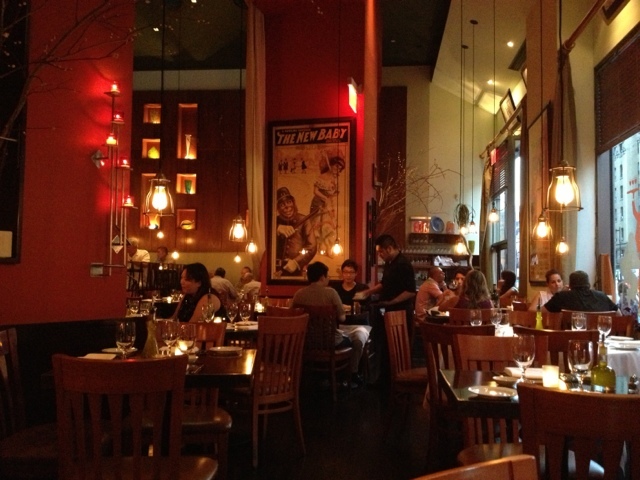 We had excellent service, fun conversation, and the whole meal was a lovely time. I'm glad I finally popped in to the restaurant I've been walking by for so many years! ABF's mom told us it used to be a fancy spot, where couples would get dressed up and meet for cocktails-- fun! It's a lot more casual now, but the fancy drinks are still there and the prices are still decent. 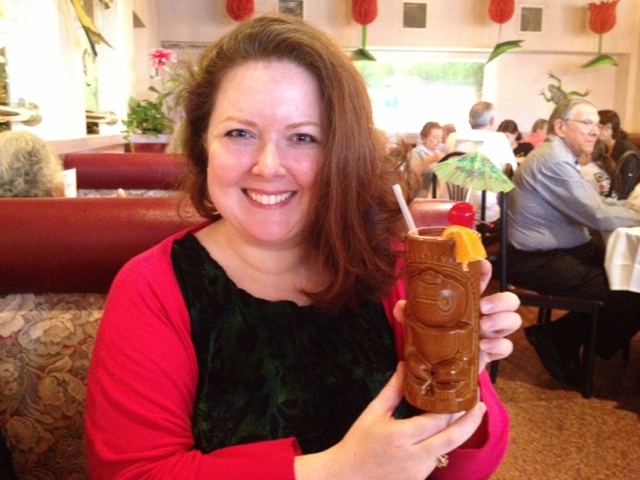 I ordered a Zombie, a nod to ABF's love of shows like 'The Walking Dead,' and my love for things that taste like candy. 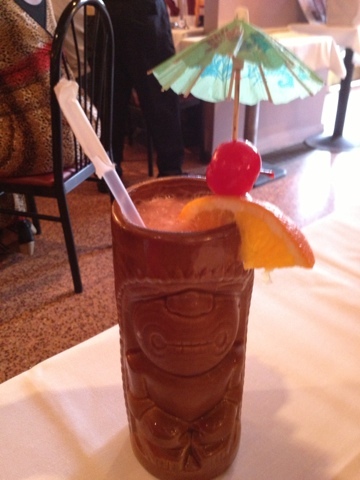 This drink is no joke-- several types of rum, including 151, and just one drink will have you feeling a little loopy. Deliciously loopy. ABF Ordered the egg roll for his appetizer, and gamely shared a bite with me. 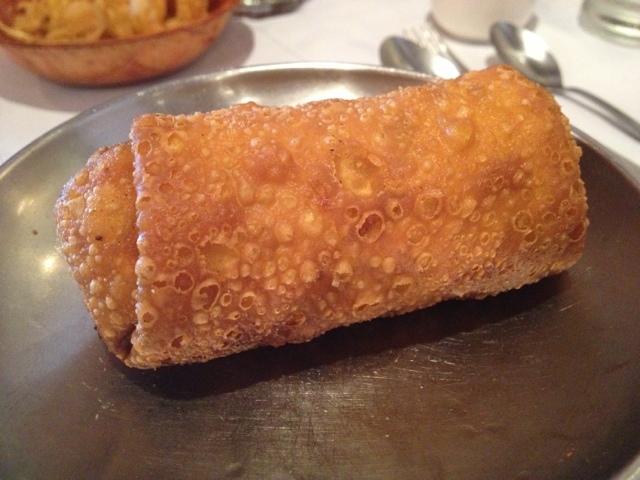 Egg rolls don't normally float my boat per se, but this is one of the tastiest ever had. So tasty in fact, I went back for second bite. 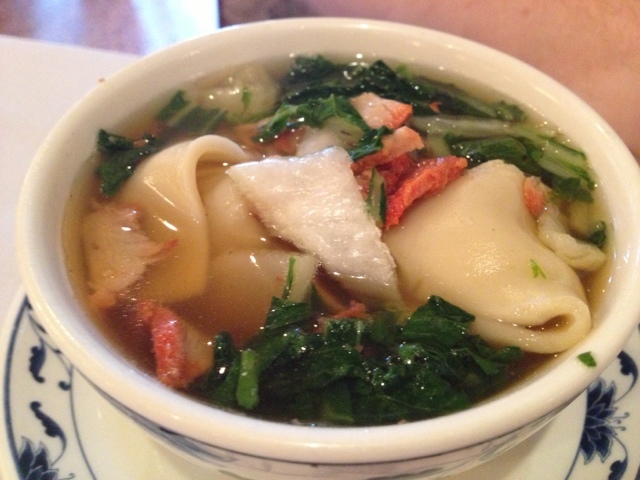 His entrée also came with wonton soup. 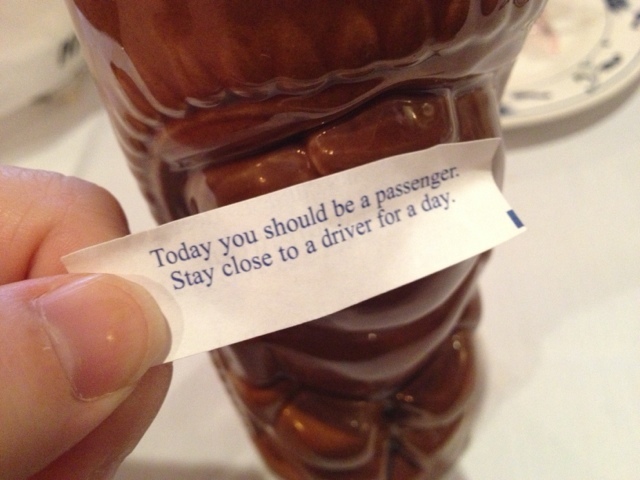 I just can't get into the wonton soup. I don't know if it's the texture, flavors, not liking the pork filling, but this just isn't for me. I didn't even bother tasting it, but ABF was very happy with it. 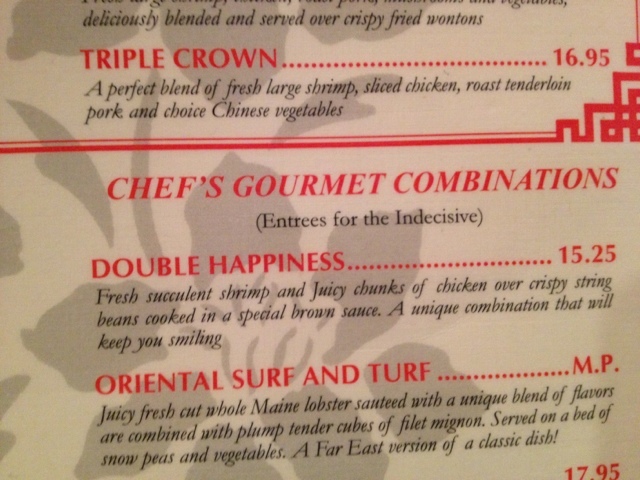 Palace of Wong actually has a section of the menu labeled for 'Indecisive People.' Yes, thank you, that's me! I went with the Empress, which is filet mignon and white meat chicken with mixed veggies. The filet mignon was perfectly cooked, medium, and the veggies were good, but I wasn't a fan of the brown sauce which clumped up a bit. 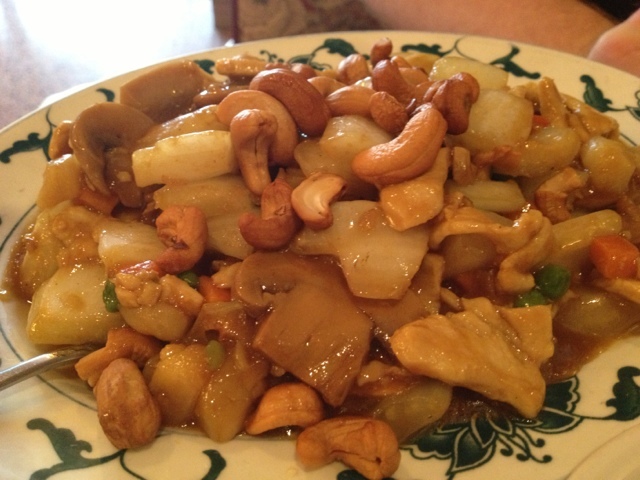 ABF ordered the cashew chicken, which was tasty, but not spicy at all (despite the warning pepper logo on the menu). The rice, which I normally ignore, was perfectly sticky and tasty. I liked his dish MUCH better than mine. 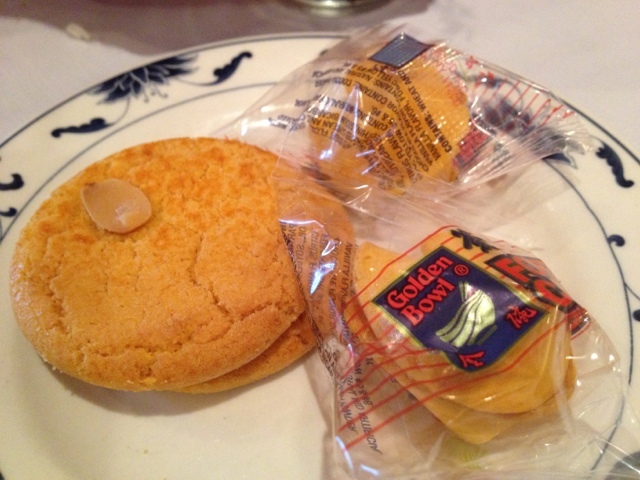 At the end of our meal we got the requisite fortune cookies (with a 'fortune' perfectly picked for me, even after just 1 Zombie drink), and some delightfully crunchy almond cookies. Those cookies were great! 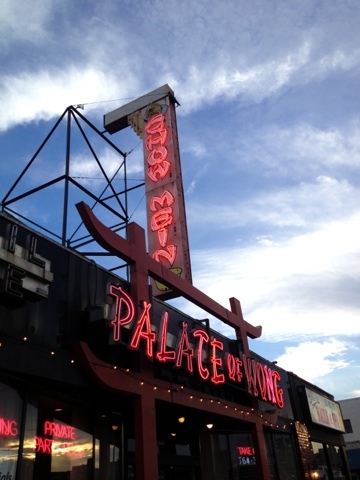 Palace of Wong may have underwhelmed me with the entrées (not bad, just not GREAT), but the apps and drinks alone are reason enough to pop in for a bite...and a sip!